Ibanez MSL Metal Screamer from Master series. Made in japan around 1986. These seem to be rather rare these days. And with rarity, or scarcity, come a price tag that’s not for everyone. I happened to score this unit with some nicks and dents from Mr. Lindén in a batch deal for a good price. Needless to say i’m not parting my way with this one anytime soon. Somehow i wish Ibanez should have manufactured these commercial flops in greater numbers. Mainly because people are simply stupid. Number of SML Super Metals available today is high, since people bought them a lot. 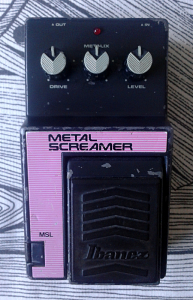 It’s not a great pedal, but still it apparently sold better than the Metal Screamer. One wise man on the internet once said, this is the one design in all Tubescreamer family that’s usually just forgotten from the TS canon. The truth is that MSL is more of of a TS than TS10. Before going deeper in to the circuit, let’s open it up. 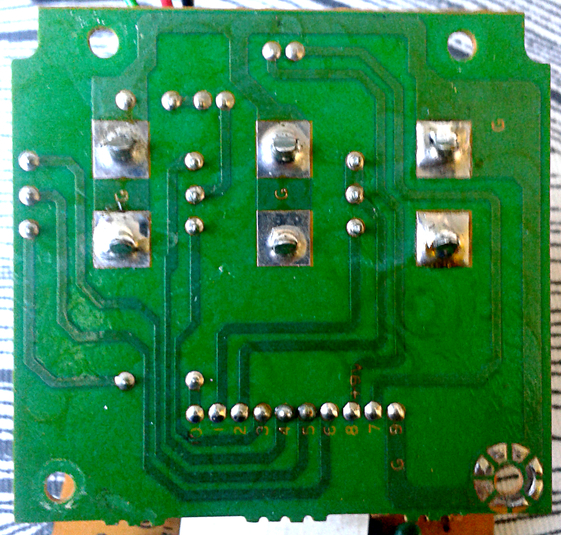 Opening the bottom plate shows your standard Ibanez board with similar traces as most pedals of the series. 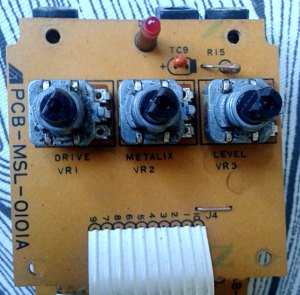 The boards (controls have their own board, as all the other boxes in the series) are thick and overall feel of the electronics is just solid. Not a beauty, but all solid. Black silk screening also looks very pleasing with thick lines. Chip here is JRC4558D and it is socketed. So i’m fairly certain that’s not original part. 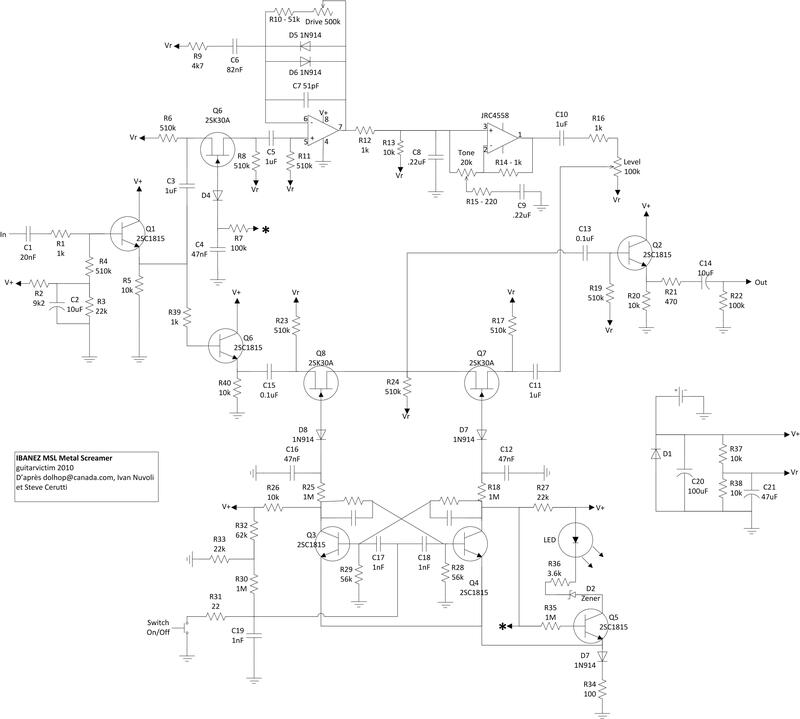 Schematic up at Tonegeek page shows the chip as 4558, but knowing Ibanez, there may have been another chip in there when this left the factory. 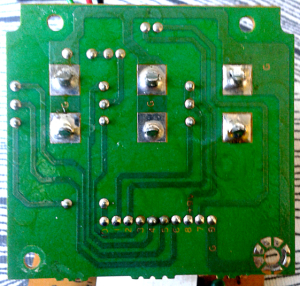 And Maxon/Ibanez boxes never used sockets, so this part replacement assumption is based on well educated guess. Now. If we take a look at the schematic, we see standard Ibanez electronic switching and input/output buffers are also per many other Ibanez boxes. Reference voltage for input buffer has its own network, separate from all the rest reference voltage points. Tone control and rest of the topology is is per TS9. So yeah. It is more of a TS9 than anything else. Since we’ve now established that the circuit is pretty much TS9, let’s focus on the differences. There is only one. And this one difference makes a world of difference. 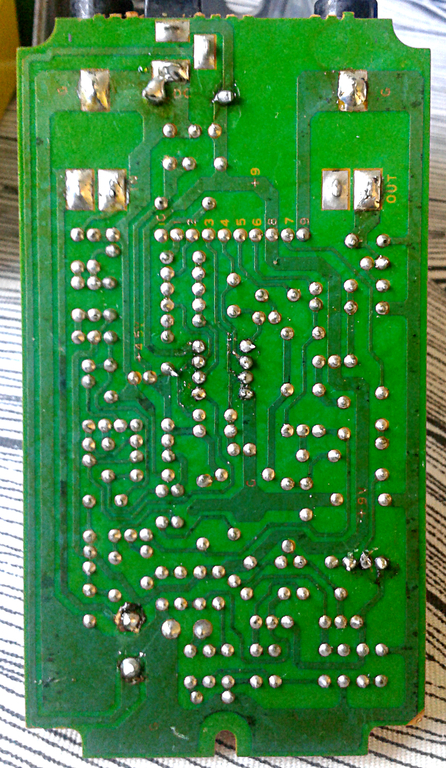 Notice the C6 capacitor coming from non-inverting input to R9, 4K7 resistor. This cap is 47nF in every other TS. 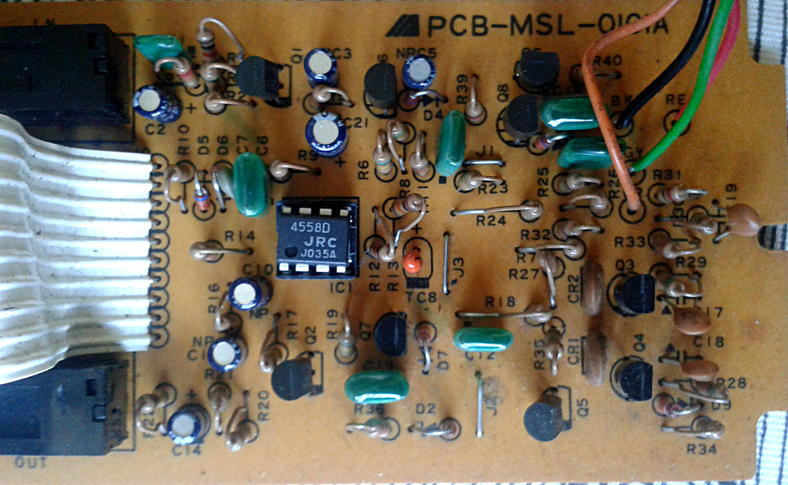 This capacitor determines the roll-off frequency for the high pass filter created in the clipping amp. Value of 82nF lets a noticeable amount more bass through than the stock TS9 configuration. This means that one could easily just swap that capacitor for 47nF and voilá, instant TS9. Doing this wouldn’t make any sense though. This is the cap that gets its value up in every possible mod know to TS***/SD-1 world. 82nF is a lot better choice instead of TS9 stock value. Like a Tubescreamer with slightly added bass content. As Tubescreamers come, this is simply better sounding than any other version. 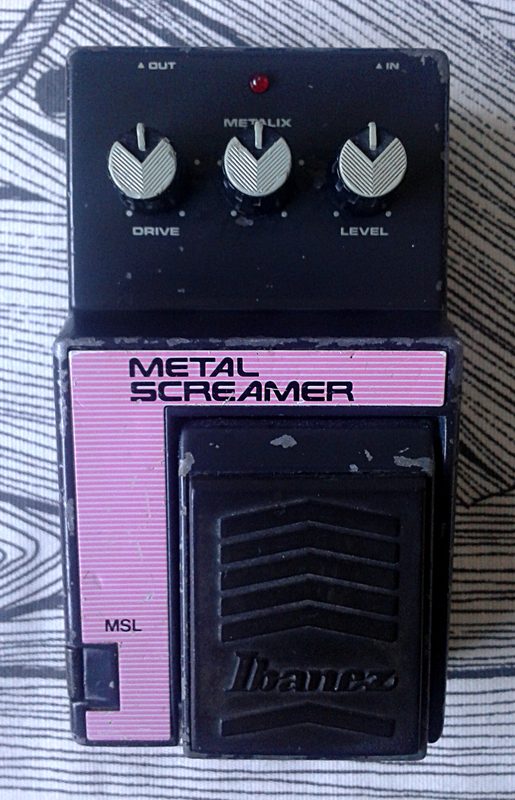 Ok, maybe not better than Super Tubescreamer from 9-series or TS7 with its hot mode. But as a vintage styled TS.. This takes the cake. Added bass takes a bit of the worst honking away, while the overall tone still feels like a TS. This is good. Highly recommended pedal. Especially if you don’t have to pay massive amounts of money for one. This entry was posted on Monday, November 10th, 2014 at 10:22	and is filed under Ibanez, L / Master-Series. You can follow any responses to this entry through the RSS 2.0 feed. You can skip to the end and leave a response. Pinging is currently not allowed. Entries (RSS) and Comments (RSS). 20 queries in 0.062 seconds.